Mobile gaming has been increasing in popularity over the past few years, and the increasingly sophisticated technology of smartphones and tablets make it easier for players to have access to different types of games for those platforms. Many mobile games are panned as being low-quality because they try to emulate the experience of traditional console or handheld games and fail. However, Lifeline takes an entirely different approach. 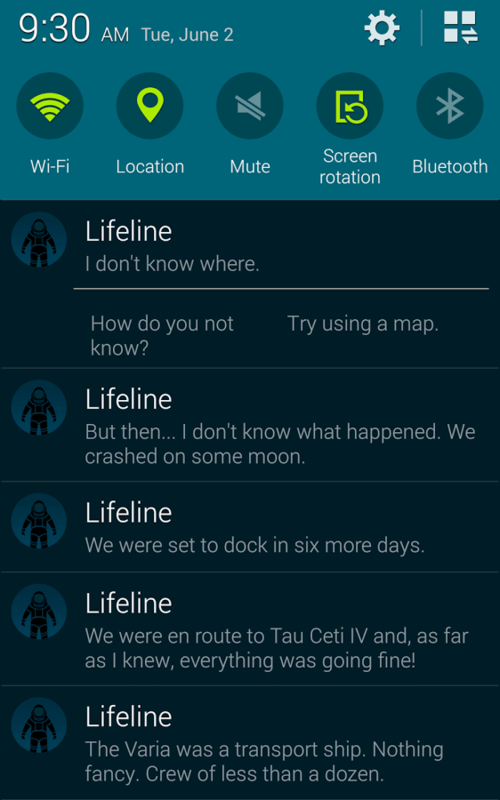 Lifeline can best be described as a visual novel, or maybe text adventure would be better considering there are no visuals to speak of. It works like a Choose Your Own Adventure novel, except it’s not your adventure. 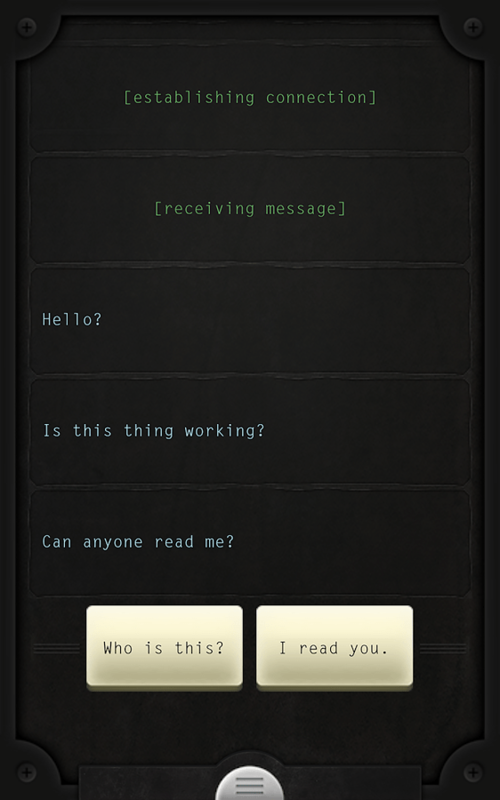 The game starts out with an incoming message. It’s from Taylor, a survivor from a space ship that crashed into a deserted alien moon. After responding to the message, he—or she, the game doesn’t specify, but I’m not fond of Taylor as a woman’s name—will tell you the situation and all about his surroundings, ultimately asking for your advice on how to proceed. You will be given two options for your reply. Taylor will continue talking to you as he does whatever you tell him to, until the next choice needs to be made, all while haunting, ambient music plays in the background. You can scroll up to see past messages and the choices you made if you need a refresher. In theory, these choices should branch the story, but I find it hard to believe there are that many paths. A lot of the decisions seem either redundant, repetitive, or even unnecessary. Sometimes, Taylor will react to something with an exclamation, and you’re prompted to either ask what he saw or ask if he’s okay. The simple responses he gives you make it seems like what you say to him doesn’t matter, beyond getting an extra piece of dialogue or two. Also, there are times when the option you didn’t choose comes back up again, which I took as a hint that that’s the way to progress the plot. Ultimately, there were only a few points where I’d say what you chose affects the outcome. Taylor is supposed to be a student scientist, performing research experiments on lab rats while en route to an alien planet. For someone who is supposedly smart, he doesn’t come off as that bright during the game. While all the dialogue choices are probably designed to keep the player interacting with the game, it makes Taylor seem like he can’t make a decision for himself. Asking where to explore or for advice on handling a situation is expected, but having to tell him whether to stop and eat or keep walking, or to take pain medicine or not makes him seem needy and incompetent. One thing that bugged me—and this is purely a nitpick on my part—is that Taylor wasn’t exactly behaving like someone in his predicament. The story combines elements of Science Fiction and Survival Horror. As such, he should have been panicked and apprehensive throughout most of his adventure. He did reach panic mode a few times during the more intense, dramatic scenes, but he always seemed to have not only the time for, but the state of mind to make snide comments and references. He frequently joked about not knowing the metric system, he would reference movies and other pieces of popular culture, and when describing something he encounters as unusual, he would often stop to point out the entirety of what he’s experienced on the moon is unusual to begin with. He would also recap events that happened. When mentioning a specific item or location, he would recite what occurred in that place or what the item did. This seemed like a weird thing to do, especially when time is of the essence. I’m not sure if this was a designed quirk of his, or something done by the game’s writers to refresh the player’s memory. If the latter, it seems unnecessary, as you wouldn’t forget events in a book when you put it down for the night. All in all, these moments, while they didn’t ruin the game or the experience, were fairly jarring and felt like a violation of the fourth wall. I have vast experience with Science Fiction, but not much in the way of Horror—games or otherwise–so I kept to the more conservative dialogue choices. I wanted to explore the game for as long as possible, learning as much as I can about the moon and the situation unfolding, so my goal was to keep Taylor safe for as long as possible. At the first sign of danger I would tell him to run. In the long-run, I probably missed out on some information that could have been gleaned from sending him further into peril, but I felt the trade-off to be worth it. Although, I did feel there were a few too many unanswered questions after completing the game, I’m not sure if the alternate branches of the story would explain them. 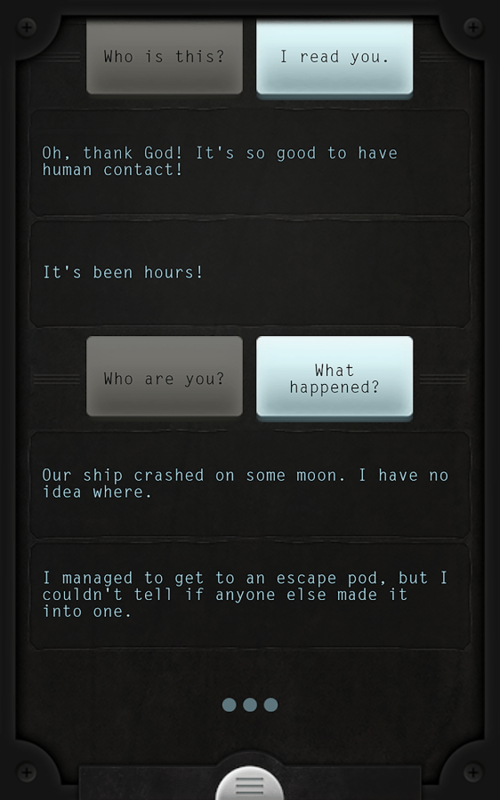 The true genius of Lifeline is the way in which the player interacts with it. Events in the game occur in real-time. When Taylor says he’ll get back to you in a few minutes, he means a few minutes. If it’ll take him an hour to get somewhere, it’ll take an hour, and when he goes to sleep at night, he won’t send anything until morning. If the game isn’t the active app on your device, you’ll get a notification when Taylor sends you a message (assuming you have them enabled). While the game reacts in real-time, you don’t need to. You can take as long as you need to respond. There’s apparently an auto-save feature so that if you close the app or turn off your phone, you’ll pick up right where you left off. I felt there were a couple missed opportunities to increase the player’s involvement. At one point, Taylor asks you to look up some information for him. He even waits a few minutes before asking for the answer, making it so you can’t just continue on ignoring his request. This only happened once, and while I wish the game was more interactive in this sense, it might be for the best since the game’s popularity led to not only the question be auto-filled in Google’s search bar, but the top results were discussions about the game. There was also the complete absence of any information about the player. Where were you supposed to be? Why are you the only person Taylor could contact, and how was it possible? It’s clear that this is taking place in the future, or at least a futuristic world. I suppose it didn’t matter if I was a random person on Earth, an alien on another planet, or if I was on a passing space ship. Maybe I’m just myself and the messages went through space and time to reach me. While I can understand leaving it open-ended, I would have appreciated the context to help enrich an otherwise unremarkable story. 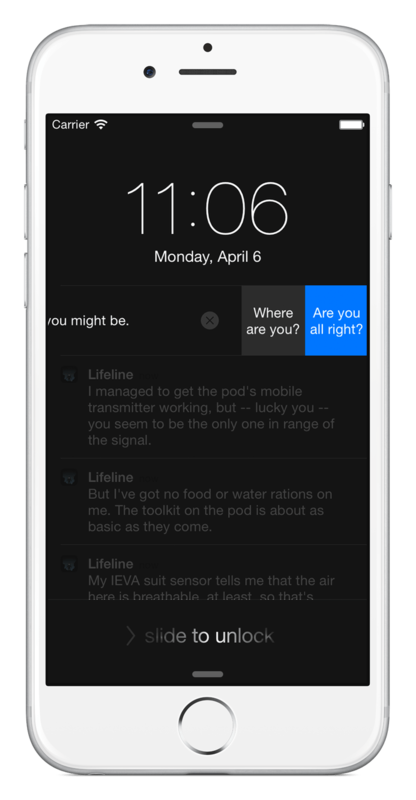 Lifeline as seen on an iPhone’s screen. Even though I found the story to be little more than average, it was still an interesting tale and I really enjoyed the game. Being in real-time, Lifeline isn’t a something you can just sit down and play through in a few hours. It takes three days to finish the game, although it took me significantly longer since I started just before an incredibly busy week of E3. The way the game’s interface works, it became a part of my phone-checking routine: read new text messages, look at new email, check social media notifications, and see what Taylor’s up to. This interface sets Lifeline apart from other mobile games, and in essence, is what mobile games should aspire to. The free-to-play model irritates too many players and mapping gamepad controls to a touchscreen for platforming or role-playing games doesn’t work well. A smartphone (or tablet) is its own device, with its own functionality. Game designers should look to use that functionality for the benefit of their game. Considering beating the game unlocks a rewind feature which lets you go back to play for the other paths, this $2.99 app is well worth checking out.